Good Morning! Happy Tuesday. I love a surprise bonus…whether it’s finding a £5 note in a pair of jeans in the wardrobe, or getting an expected tax refund. Today I remembered that I have a day of annual leave booked for Friday so I have a short work week. That’s way better that finding a fiver in a pair of old jeans for sure! Today I’m featuring a new release by Granola for the FaMESHed X event which opened a couple of days ago. It’s an adult rated event and Granola have produced this beautiful Antique Opium Den. It comes in 2 colour versions – blue and red with either a gold or silver detailing. There is of course an adult version for the adult event but you can purchase PG too if you prefer. I really like that more creators are incorporating bento animations into their furniture as it really does make a difference with immersion into a scene and there are many bento animations included in the items. 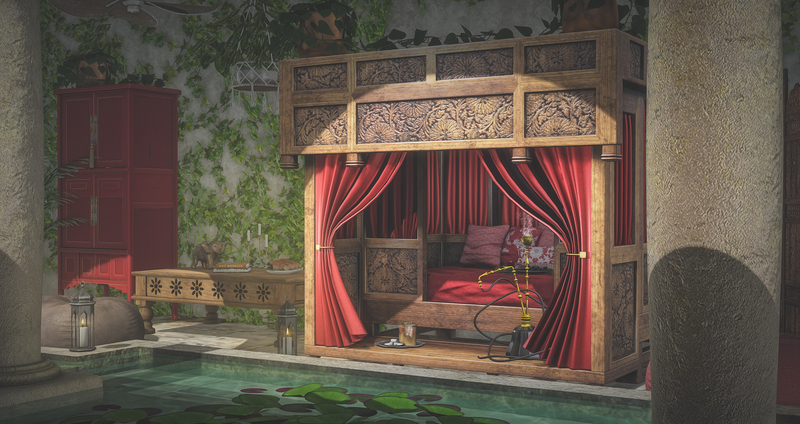 The Hookah is also from Granola at FaMESHed X and available in a number of colour and texture options. Hope you have a great day…it’s one day nearer Friday!